A graduated microvial was filled with 10 mL of ignitable liquid. The vial was placed into a dry bath in which the height of vial and temperature of dry bath were adjusted according to the percent volume evaporated. Nitrogen flowed gently above the ignitable liquid and a vacuum pump used to remove the Iinitable liquid vapor from the vial into a trap. This was to prevent the vapor from condensing back into the vial. The nitrogen needle and vacuum tubing were cleaned between samples and replaced when needed. Evaporation percentages were 25%, 50%, 75%, 90% and 95%, corresponding to volume reductions of 2.5 mL, 5.0 mL, 7.5 mL, 9.0 mL, and 9.5 mL, respectively. During the evaporation process, twenty microliters of igntiable liquid was collected at each of the volume reductions. One milliliter of carbon disulfide was added to an autosampler vial containing the evaporated ignitable liquid. Twenty micorliters of ignitable liquid was deposited into a quart sized metal paint can with 100 grams of Hyponex brand potting soil purchased from Kmart. Once sealed, the liquid and soil were mixed. After the specified time period (0, 7, 14, or 21 days), a whole activated carbon strip attached to a paperclip and nylon string was suspended into the headspace of the can. The can was placed into an oven at 65° C for 16 hours. Once the can was removed from the oven, it was allowed to cool to room temperature. The activated carbon strip was cut in half, and then one half was placed into an autosampler vial with 500 µL of carbon disulfide. 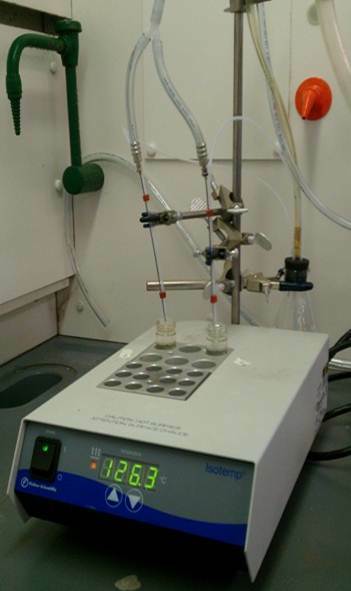 Ignitable liquids were prepared by diluting 20 µl of ignitable liquids with 1 ml of carbon disulfide.